All those who own a DARwIn have felt the low run times the standard DARwIn-OP battery provides. The stock battery that comes with the robot is only 1 000mAh (the same as a Bioloid PREMIUM) but on DARwIn it's powering way more equipment: more servos, more hardware including a FitPC2i and camera) making it's run time about 10 minutes from our experiments. The cavity for the battery has also got plenty of room to accommodate a much larger LiPo. 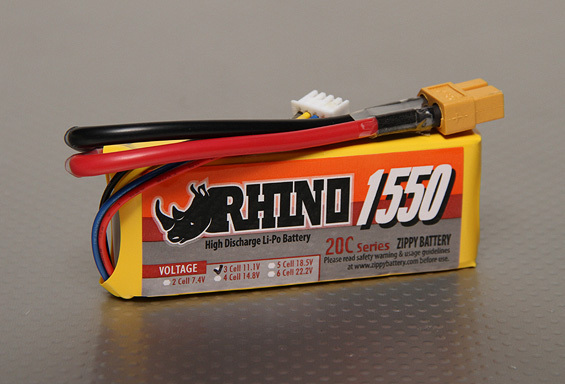 Therefore, we were able to source a higher capacity LiPo (1 550mAh) and the appropriate connectors. 1 550mAh is not yet the ideal for such a large robot but it's a good improvement over the standard battery (1.5x more power).